Hi all, would love your input into this quandary as hubs and I have been going back and forth on it. 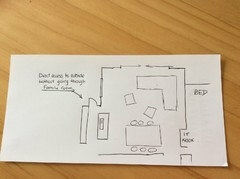 Our plans attached allow for 2 x double sliders which meet at the column in the kitchen/family external wall. We are worried that this is going to feel clunky and make a "not massive" space feel a bit under thought out or like we've missed an opportunity. The alternative sliding, rebateable stackers come with a significant $$ adjustment. Yet, I feel this might be the spot to invest, even if it means sacrificing somewhere else. There will be no TV in this space. It is for socialising, connecting and actually talking to people (my children are disgusted!). What do you think? Are there other alternatives? I'd be glad to have your thoughts. I can hardly read your plans so not exactly sure which space you are talking about. Having had sliding doors of 2, 3 and 4 panels and bifold doors - all leading out on to the same deck, at different times over 20 years - I can say that the widest possible opening is usually well worth the additional cost. 3 panel stackers are good value IMO. 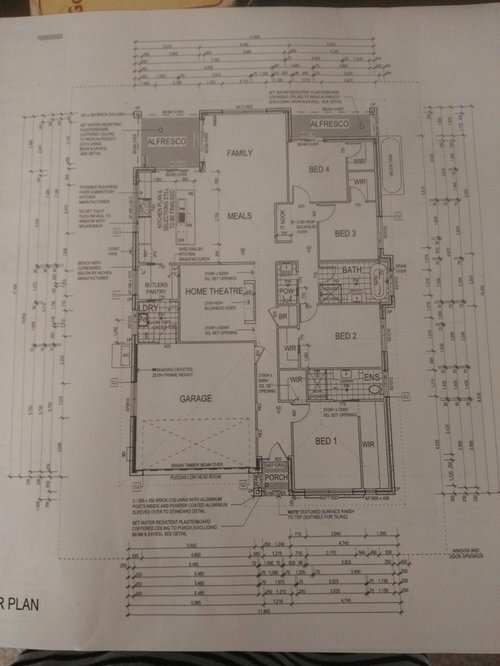 Although a space without the obstruction of a corner upright is lovely, it comes at a premium price - we have been quoted $60k for a house we are about to build. Just not worth it for most situations... and so many other things that can be done with that sort of money. I like bifold but we don’t open them up fully as much as I’d thought we would. Hope this helps. Gosh Susan, 60k. Wow...or should that be woe! Thanks for your advice. With both scenarios you are pondering, will there still be a column in the corner? Or will the stacker option with engineering get rid of the column. If the column will be there anyway, I would tend to go for the sliders. You mentioned rebatable. Stackers doors do not disappear into the wall. There will still be the width of one stackable glass panel in your doorway. The plans are faint, but it looks like the openings are about 2ooo. You would still have a glass panel across at least a third of this opening. So unless the column is removed, I would save your money for other priorities. With stacking doors, a fixed panel is still required. 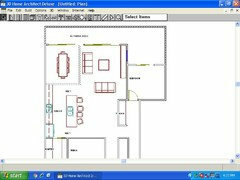 Have you measured the space of the fixed panel you will need and compared that to the fixed panel of the sliding door? We have both a sliding door and stacking door leading to our deck. This was due to a column in our living/dining area. We have the doors open most of the time and the stacking doors do create a real lovely open space. Siriuskey, so something like this? Yes I see what you mean, and I see in your photos what we want to end up with, that sense of flow to the outside. I just think the column completely changes the space downwards and inwards and prevents that kind of engagement. I guess when we started out we just wanted to get a base that was in the budget at that time. Since then, we've been able to shore up some extra funds, so I feel like we should. But beams and stackers don't come cheap! Hi Sunny Day, as myself and Antonia d have noted. You still have the fixed panel of glass with stacker doors. What is the actual measurement of each opening. I have a 2600 opening with stacker doors including frames. The fixed frame is 800, first door is 850, second door with lock is 900. When the doors are fully open I only have approx 1600 of opening, taking into account the framing. I would get information from a stacker door expert to ascertain the actual space that would be open, when both doors are fully open. Then make an informed decision on whether this is what your vision is. I think it is a good decision to have stacker doors, but I'm concerned you are looking at photos that are not the same as your potential opening, therefore getting a false interpretation. Throwing a spanner in the works. Why not have full stacker doors opening on the wall from living area (top of plan) onto your decking. You have said there will be no tv in this room and there is a window already in that position. 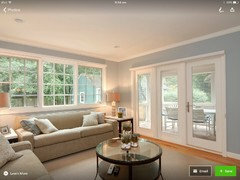 You could have a fixed window on the living sliding door wall, and a sliding door on kitchen wall. When you walk from entry, you would have wonderful views of back yard. It would draw people to the outdoors. Just a thought, thank you. dreamer, the openings are both 2200 wide, so slightly smaller than yours. thank you for the very valid point about the actual finished opening, a very useful offering. Another thought SD, You kids, and no TV in the Family room, I wonder about having the IT station out of sight, could you reverse it so that it opens into the family room, or make it a two way station so that you could keep an eye on computer use. And agree that you would be better off spending the money on a beam to allow for no support post as 2200 opening isn't very wide, that would also suggest that your island is only 600 deep and should be 900 if you want stools to sit up to the island? Having the open corner without a post or column in the corner is a great look, but you really need to get a price to work out if there is the value for your household in the cost of the extra engineering required. I would have a chat to your window supplier to see if you can actually see one in action to see how easy it is to open and close, especially if you have kids. Also consider the boring practicalities of flyscreens and security. 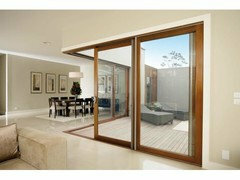 I tell my clients that bi-fold doors are a bit like owning a convertible car. They look great in photos, but sometimes they aren't as practical for day-to-day use. Like a convertibale car you probably have the top down on the same types of days that you have your bi-fold doors fully open. With your location how many days a year would your drive a convertible car with the roof folded down? Siriuskey, island is 2700 long and 900 deep. We are having TV points in other rooms, just not this one. interesting re the IT nook. Dr Retro, the voice of reason as always. And a great analogy there! I'm so grateful for everyone's advice really, I feel like now when we get the quote, I have some targeted criteria to address when deciding if we should spend the money. I thank you all. I think oklouise adds a good point with the size of the alfresco. You will only be able to have a small setting under the alfresco. If you need at least a 6-8 seater table then I would leave the doors as is and consider options to extend the alfresco roof so that you can use this space. I do like dreamers idea with stacking doors on the wall which will face the deck. With adding a pool are you also adding a Toilet and shower facility, would you consider the possibility of swapping bed 4 with the media room and laundry/WC, so that this could be accessed from the pool. This would open all living spaces to the extended deck and pool. thanks Siriuskey, I guess we're coming at it from the point of opening up the living space more than accessing the yard. While the alfresco areas are not huge on the plan, there will be decking to join and extend them and we're planning on additional shade measures as necessary. Also the idea of the alfresco of bed 4 was to provide a quiet spot that can be used for an afternoon snooze or reading a book away from the noise of the house. So I'm happy with the layout from that point of view. I don't believe you'll get the full effect using a stacker with a corner post/column removed. Not enough room for bifold doors either. It'll look ok on paper but in reality its a no from me. The extra 'openness' is minor considering the costs involved to achieve it. thank you MB design for your honest opinion and also providing me with an alternative, I appreciate that. 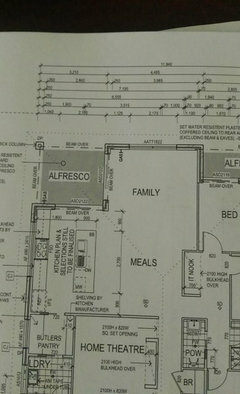 Can I suggest that you make that alfresco room part of the family/kitchen/dining to make a bigger space, the kitchen @ 900 between island and wall at both ends is very tight, this would allow for better flow in the kitchen and be able to keep the 2700 Island. Try push the stacker door out of the house. Like what I did in this photo. It will look great and no more fixed panels. There will be water going to the track, just talk to the manufacturer to allow some weepholes and engineer how to drain it properly. Add some extra threshold plate to be put in the track to block water. You also need to engineer how to block the gap when in closed position. I put in a small hinged window at the track opening. Stacking, folding, post or not - it won't really change much - the alfresco is too small to be a proper alfresco either way you spin it. You'd be better of like siri suggested to utilise it as internal space and improve the compromised scaling of this area, and then develop a deck or partially covered overhang to the rear and put in some stackers or bifolds centred to or completely along the rear. Make a big move with far greater practical and multi-layered impacts/benefits. Thanks Paul, that's what stands out to me, as you say the alfresco is too small along with the space 900 at the each end of the island, it would need to be reduced in length to work, I don't think this is a small house so it needs that area to work better. And I have also mentioned this way back on Saturday. With a slight alternative. Thank you. Sketch as per my thoughts. Reduce alfresco area. Make this a walkway to outside decking. Therefore delivery of food etc, does not have to be through family room. A fixed or opening window replacing stacker doors on family room wall, with doors at the top of plan out to the decking. Hi, we found an interim solution. We put in bi-parting sliding doors. They are two sliding doors that open in the middle, instead of one sliding door that goes left to right. They open more widely but still have a price tag akin to normal sliding doors. We decided to go with these in the first instance, and then maybe consider bi-folding doors later down the track. Hopefully this gives you another alternative. 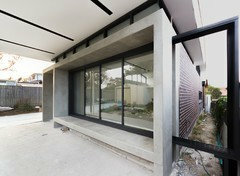 I have attached a link to images of bi-parting doors. Dr Retro's analogy with a convertible are so true. We elected to wait 12months in our recent house purchase before embarking on major renovations. The magnificent view that we thought we needed to have stacker/bifold doors for turned out to be too breezy to have the doors open for more than a few days a year. So the extra wide mullions associated with this kind of door would be impacting the view for 99% of the time. In the end we went for extra wide sliding doors (3 for a 4.6m width) with the narrowest mullions we could find. As for your quandary re the corner post, how about a very small section solid stainless steel post? Along the lines of Miles van der Roh's Barcelona Pavilion? Hi, we have built with both stackers and bifolds. I would recommend 3 door stacker storing to the exterior with no column in the centre ( so beam in the ceiling for the weight ). Reasons: The obstruction is the same regardless ( bifolds will stack at 90 degrees to the opening and stackers parallel to the opening ). Cost of fly/security screens for bifolds are also a major factor. Screens for our bifolds cost almost as much as the bifold itself and security screens are cumbersome. I'd like to emphasise Dr Retro's practical mention of flyscreens. I love bifold doors, but to put insect screens on them is really expensive, and I'd have to shut the doors from late afternoon if I couldn't screen them. When we built a house, we put in the sliding doors that Sam McD B mentioned, with 2 sliding doors that meet in the middle, complete with sliding screens. They allowed a very wide opening, but our space was much bigger than yours. We chose sliding doors purely for the reasons to add Crimsafe security screens. Allows you to keep insects out and still get fresh breezes. 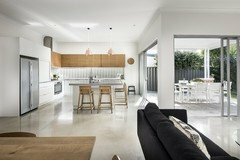 Display homes never have these installed and it always looks attractive with the wide open doors. But really not practical when your house if full of flies and mozzies. Everything depends on your location, view, climate, environment and finance. Good luck! I have just replaced sliders with stackers and oh what a difference being able to open up wider! Should I go black sliding door or am I confusing styles? What do you think of our reno plans?